Zimmerman’s peanut butter made with Dry Roasted Virginia #2 peanuts contains no artificial sweeteners, no hydroxegynated oil and just a little salt. Our peanut butter has no carbs and no trans fat, it’s high in protein, high in energy and tastes good. It will keep in the refrigerator for up to a year. The oil separation is a natural occurrence, proving to the consumer there are no additives and stabilizers in their food. 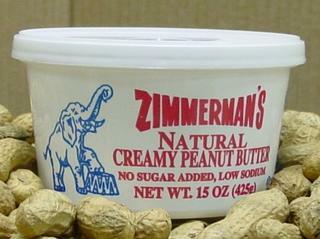 Zimmerman’s peanut butter is versatile and can be used in sandwiches, cookies, pies, icings and more. 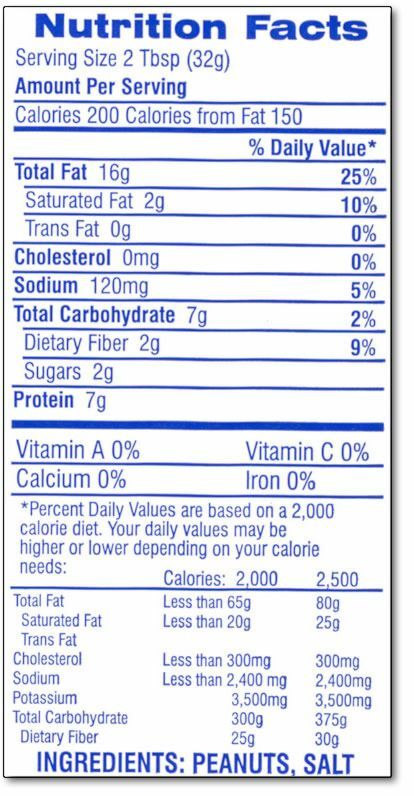 Zimmerman’s no salt peanut butter made with Dry Roasted Virginia #2 peanuts contains no artificial sweeteners, no hydroxegynated oil. Our peanut butter has no carbs and no trans fat, it’s high in protein, high in energy and tastes good. It will keep in the refrigerator for up to a year. The oil separation is a natural occurrence, proving to the consumer there are no additives and stabilizers in their food. 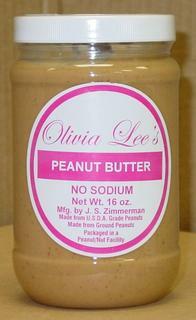 Zimmerman’s peanut butter is versatile and can be used in sandwiches, cookies, pies, icings and more. Needed to repair body tissues and develop new ones, to maintain fluid levels and to make antibodies which ward off disease and infection. Fiber Fiber reduces the risk of some types of cancer, helps control blood sugar levels and may help reduce the level of cholesterol in your blood. saturated Most concentrated source of energy in the diet. Carries fat soluble vitamins such as A, D and E and helps maintain healthy skin. Vitamin E Vital antioxidant which protects Vitamin A and body’s cells and tissues from damage. Important for the immune system. May aid in the prevention of tumor growth. Niacin Important in the release of energy from the food we eat and the maintenance of healthy skin, the nervous system and the digestive tract. Folate Important for the development of new cells, particularly during growth and pregnancy. Vitamin B6 Makes and breaks down proteins and makes red blood cells used to transport oxygen in the body. Thiamin (B1) Needed to ensure normal functioning of the nervous system, appetite and digestion. Riboflavin (B2) Releases energy from the food we eat, helps skin stay healthy and assists in the normal functioning of the eyes. Magnesium Important in the building of bones and teeth, creation of protein, transmission of nerve impulses and maintenance of body temperature. Phosphorus Component of all soft tissues. Fundamental to growth and maintenance of bones and teeth. Potassium Needed to ensure the body’s water balance and create protein. Helps release energy from nutrients. Aids in nerve impulse transmission. Iron Aids in the transport and distribution of oxygen in the body’s cells. Zinc Aids in the formation of protein, wound healing, blood formation, taste perception, appetite, and night vision. Calcium Needed for the development and maintenance of healthy bones and teeth.